Here’s a personal post with some random info about me. I’m in my 30’s & we’re hoping to get pregnant this year. I’ve never had a 9-5 job, I’ve only ever worked as a freelancer in photography. I first fell in love with photography in high school. My family has never wanted me to be an artist. But I got a scholarship and did it anyway. Going to art school was a magical experience, I felt like I belonged & I was right where I was meant to be. Yay Art center. I ended up living in Socal for almost ten years before moving back to the bay. Recently I’ve been trying to simplify my life. Spending less time on social media and trying to have less clutter. I want to feel inspired when I log into my Instagram since it’s the platform I visit the most by curating that space more. I’d like to cook more, travel more & fix up my house this year. We have a 1926 Spanish house in Oakland. When I first started using Instagram I would post whenever I felt inspired. People are now saying that in order to be “successful” on Instagram you need to post 2x a day every day. I suppose choosing not to do this means that I’m not doing the best thing for my business, but I want it to be a creative outlet and not a business strategy. That’s the artist in me always resistant to what doesn’t feel like a natural process to me. I want my feed to show more than just my photography, I want it to also show my life, my creativity and for it to be real. I love that it can be a visual diary, where you can look back at the places you’ve been and what was happening in your life. The ghost dancer Rhiannon Griego is a textile artist who makes hand woven apparel, wall hangings & jewelry. Peptalks Lauren Napolitano is a painter, muralist and tattoo artist. I love the blue snake with the white hands! I don’t have any tattoos but I’d love one of hers, being year of the snake. Mystic Mamma makes these trippy collages, gives insight on astrology and is a good wellness blog. Like this…”FULL MOON in SCORPIO opens a gateway to our truest depths, where we can really tune in to our hearts deepest desires, and gleam our truest reflection.”Serpent and Bow Rachel Blodgett makes these beautiful undergarments and bathing suits. It’s a great way to have body art when you don’t have any. Serpent and Bow Rachel Blodgett makes these beautiful undergarments and bathing suits. Looking at this group I realize that I am craving more natural elements in my life, more nature & more down time to make art. I was suppose to take a 2 week hiatus up in Mendocino in May, chillin in a cabin in the woods, getting more grounded and connecting with nature and myself. I’d like to do a trip like this every year to re-set and evaluate the year I’ve had and the one before me. Hope to take this trip sometime soon this year. 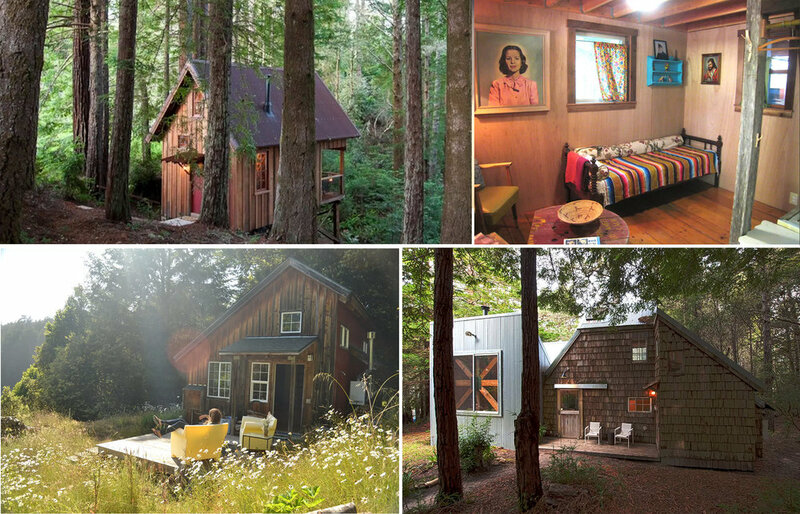 Below are the cabins I’m considering renting. Ahhh they look so good!